Sanders, A., I. Tibbitts, D. Kakarla, S. Siskey, J. Ochoa, K. Ong, and R. Brannon. (2011). “Contact mechanics of impacting slender rods: measurement and analysis.” Society for Experimental Mechanics Annual Meeting. Uncasville, CT, June 13-16. To validate models of contact mechanics in low speed structural impact, slender rods with curved tips were impacted in a drop tower, and measurements of the contact and vibration were compared to analytical and finite element (FE) models. The contact area was recorded using a thin-film transfer technique, and the contact duration was measured using electrical continuity. Strain gages recorded the vibratory strain in one rod, and a laser Doppler vibrometer measured velocity. The experiment was modeled analytically using a quasi-static Hertzian contact law and a system of delay differential equations. 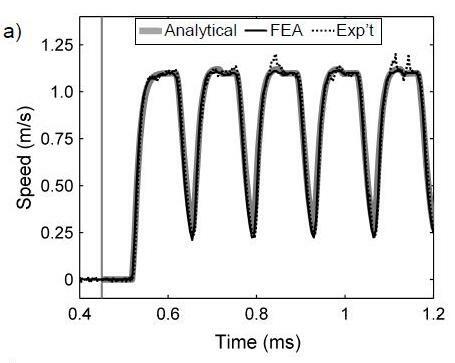 The FE model used axisymmetric elements, a penalty contact algorithm, and explicit time integration. A small submodel taken from the initial global model economically refined the analysis in the small contact region. Measured contact areas were within 6% of both models’ predictions, peak speeds within 2%, cyclic strains within 12 microstrain (RMS value), and contact durations within 2 µs. The accuracy of the predictions for this simple test, as well as the versatility of the diagnostic tools, validates the theoretical and computational models, corroborates instrument calibration, and establishes confidence thatthe same methods may be used in an experimental and computational study of the impact mechanics of artificial hip joint. This entry was posted in Abstracts, Projects, Publications, Research, Validation and tagged accuracy, computational, experiment, mechanics, models, strain, vibration. Bookmark the permalink.